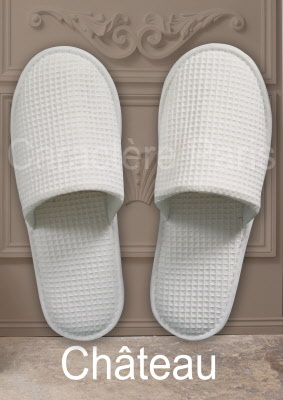 Premium slippers with a honeycomb pattern. Fabric slippers for single use. High-end Wellness slippers. Both simple and chic, with a honeycomb pattern. The model Chateau features a reinforced sole, a soft material and a honeycomb pattern. The slippers are non-washable to ensure an impeccable hygiene.